Wildlife photography can be difficult at the best of times, and it only gets harder when your subject has the ability to fly up-and-away further than you’ll ever be able to follow! I won’t deny that a large part of photographing birds can depend on luck even for the professionals, but that doesn’t mean you can’t follow these simple tips to really maximise your chances of capturing some incredible images of birds in their natural habitat. 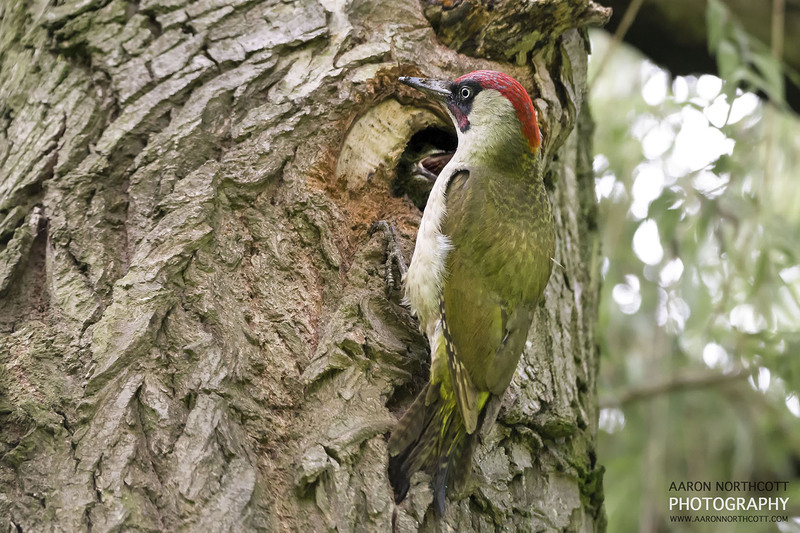 A Green Woodpecker feeds it’s young hiding inside the nest. The more you understand the species you’re trying to photograph the better, and a simple internet search should provide you with lots of essential information. Find out about the sort of habitats your subject normally lives in and the foods they prefer – and head to somewhere with the same environment and food sources. Some species are active at night and others during the day, and there are many species that are largely only active around dusk and dawn. Plan your time in-the-field around this and make sure you arrive with plenty of time before your subject is normally active, maximising your chances of success. Spend some time looking at photographs already taken of your subject online and make sure you know what to look for; sometimes the juvenile of a species will look drastically different to the adults. Males and females are sometimes so different that they’re easily mistaken for completely different species! Use a sturdy tripod! The longer lenses necessary for photographing birds are inevitably quite heavy and even with a fast shutter speed and high ISO, you’ll struggle to get the really sharp shots without using a decent tripod. The tripod I love to use is the Manfrotto 190 tripod combined with the Manfrotto XPRO Fluid Head. The Manfrotto 190 is my go-to tripod because of its versatility. The legs extend in 3 sections up to a height of 181.5cm and have the ability to lock out indepently at 4 different angles – meaning you can easily manoeuvre the camera into any position or angle without even having to detach it from the tripod! An additional bonus is the centre column; which is able to switch to a 90degree angle and really maximise your creative options when setting up a shot. Although in the past I have been a big fan of Gimbal Heads for wildlife photography, the XPRO Fluid Head has really won my favour. It is wonderfully intuitive to use and has an adjustable resistance dial, meaning it is easily adjusted to suit the size and weight of the lens you’re using. The long arm makes it incredibly easy to track your subject even when in flight, and will remain perfectly static when you let go – giving you the ability to react quickly and confidently when your subject suddenly takes flight or changes direction, with no need to unscrew locks or holds as with many Gimbal heads. The XPRO Fluid Head is also a lot lighter and smaller than gimbal heads, making movement much easier in the field. Choosing a camera with a fast shutter speed and capability for higher ISO without excessive noise is essential for capturing sharp and professional images. Even when not in flight the movement of birds can be very fast and erratic, meaning that without a quick shutter speed your shots will often be blurry. Compensating with a higher ISO is often necessary and using a higher aperture not only creates a beautiful shallow depth-of-field, but also allows more light into the camera and makes a faster shutter speed possible. I will often use either a Canon 7D or Canon 5D Mk III for bird photography. Finally, consider your lens. There are a lot of options with lenses and although prime lenses are often thought to be sharper, I personally tend to prefer a zoom lens when photographing birds as it gives me maximum flexibility when shooting without the need to carry a heavy backpack with multiple primes. A firm favourite lens for my wildlife and bird photography is the Sigma 150-600mm, it has an incredible range and produces beautifully sharp images with minimal lens distortion. 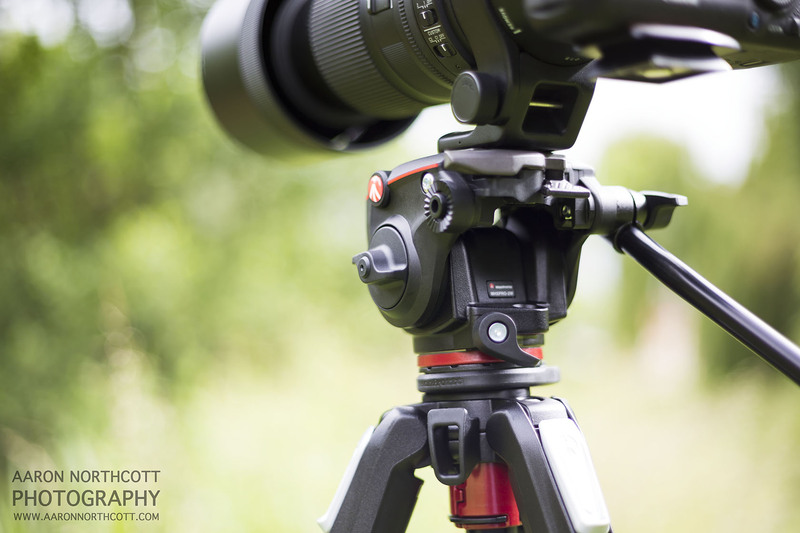 It is quite a large lens, but really isn’t an issue when using the Manfrotto set-up and includes some fantastic features, including two stages of optical stabilisation and the ability to lock the lens at different focal lengths. 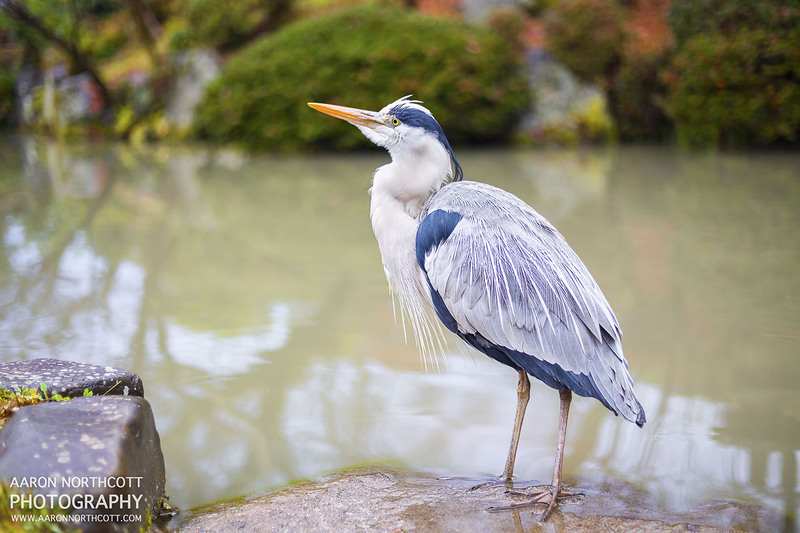 A Grey Heron poised besides a small pond, still deciding whether me and the camera are a threat. Many renowned wildlife areas such as nature reserves, estuaries and parks will have a visitor centre or main office. It is always worth popping in and having a chat with the staff and other visitors to the park, as you’ll often gain valuable information such as the location of recent sightings, regular feeding sites or if you’re really lucky you will find out where your species is nesting! There is a large and enthusiastic community of bird watchers and bird photographers and you will find that many are happy to talk to you, share their encounters and experiences and learn from you as well – so go and be social! 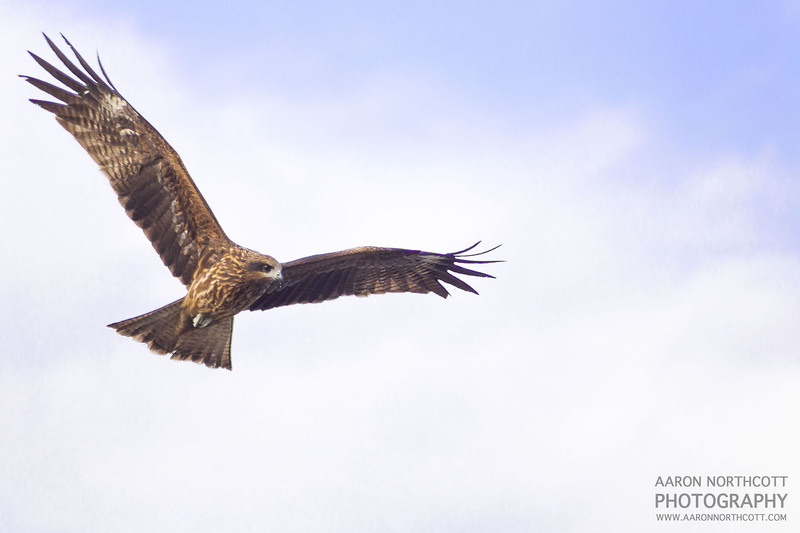 The Black Kite swoops in circles above, searching food along the river bank. The knowledge of rangers and guides is truly invaluable and you’ll find that there are often guided nature walks and tours for small groups around local reserves and areas of environmental interest. Taking one of these tours is a fantastic way to not only familiarise yourself with a new location, but often offer the opportunity to catch glimpses of your subject along the way and start to recognise the sound of their call. I’m not suggesting you try to photograph your subject on the walk itself, but simply use it as an exercise to learn and better understand your subject for when heading out solo. 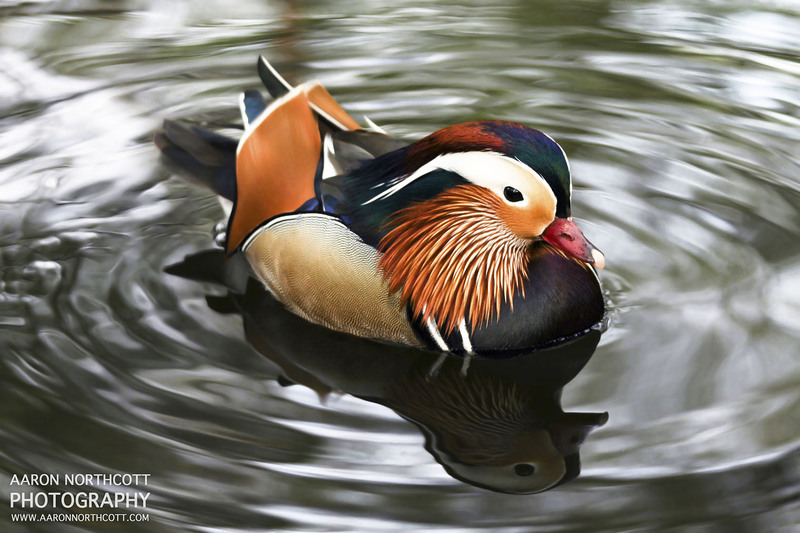 A Mandarin Duck photographed in the early morning reflections. My final suggestion is to practice your patience! When I first started shooting wildlife photography I never had the patience to sit in a hide or stake out a nest for hours at a time – after spending half an hour hearing my subject singing nearby but never quite in popping into the frame, I would instead opt to wander trails with my camera and tripod quite indelicately. Although I would often stumble across many more species and examples of the subject I was trying to capture, my intrusion would simply scare them all off before my tripod could even touch the ground! I quite quickly learned that the best way to get a beautiful image of my subject was to combine all of my previous points – suitable equipment, research and local knowledge – and then simply wait. Although it will take time, the results will be worth it. I hope that these tips will help you and hope that my images may even inspire some more of you to give bird and wildlife photography a go! You can see more of my images here: www.aaronnorthcott.com.